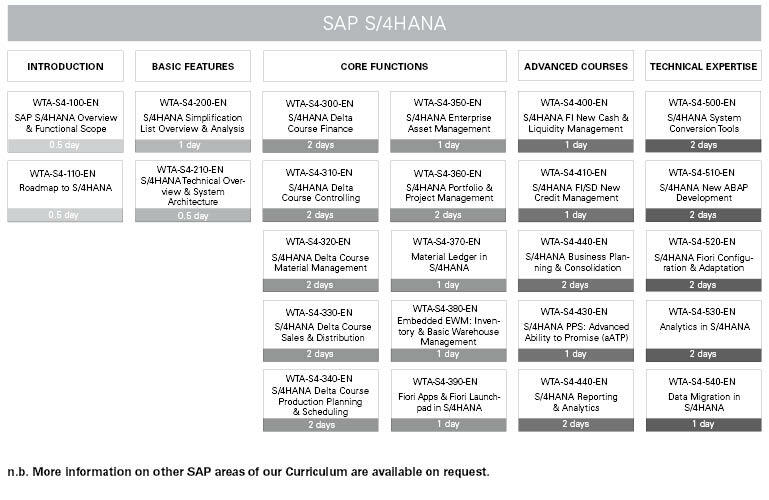 Start your SAP learning journey. Train as a Westernacher consultant. Benefit from our maximum flexibility and equip your team members with SAP knowledge anytime, anywhere. Through our training programs you will acquire necessary knowledge and skills in a real business context in order to derive maximum value from your SAP solutions and enhance technology proficiency across your company. Whether you are searching for standard SAP education courses, or have specific needs based on your business processes and industry, we offer training based on our consultancy experience and originally designed to train our own consultants that can be booked as standard or customized to suit your requirements and circumstances. Why choose Westernacher Training & Enablement? 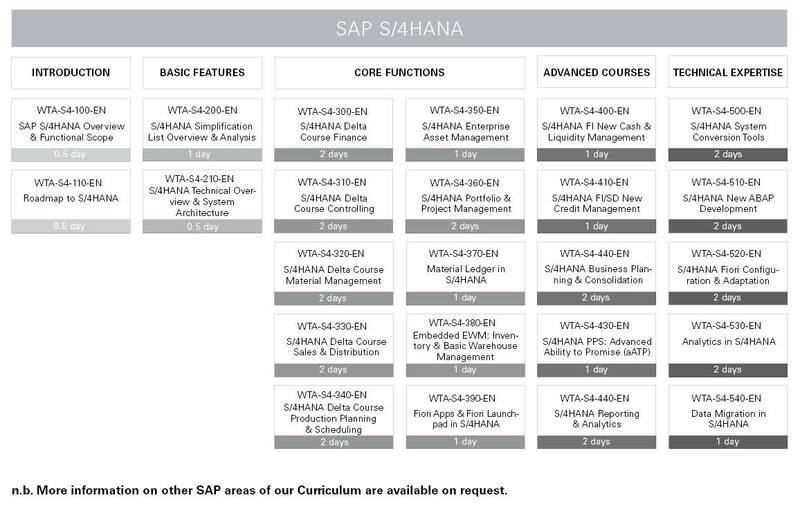 Our standard training catalog gives you quick access to the fundamentals of each SAP area. You can choose any topic in our standard learning modules. For each area, a learning curriculum shows the various available courses that can be delivered. Each training module includes an introduction and overview, basic features, core functions, advanced courses and technical expertise. Top-quality material is designed by our highly experienced consultants. System based practical examples and exercises can be found in each chapter. Courses are delivered as cost-effective, in-house training. If you have special requests for your SAP training, our tailored programs are the right choice for you. The data in the customer’s SAP systems can be modeled to reflect the business. This way, participants have a relevant environment to work with, rather than arbitrary test data. n.b. Training will be performed in a customer training environment. In case there is no customer system, Westernacher could perform a system demonstration on its own landscape. Success depends on your people quickly becoming proficient with new systems and applications. SAP Learning Hub is tailor-made for this critical challenge. It offers enterprise-wide access to the full SAP knowledge base of guided skill-building, social learning, and self-paced training through multiple formats such as e-learning and e-books ‒ all for a single affordable subscription fee. SAP Learning Hub is cloud-based, enabling you to learn at your own pace and tailor a program to suit your individual needs. SAP Learning Hub is a standalone learning platform that can also be combined with Westernacher training as part of a blended learning strategy. A private cloud version of SAP Learning Hub is also available to offer additional flexibility and customization options. is the leading knowledge content management solution that helps unleash the full potential and productivity of all your employees. It supports the entire extended workforce by allowing fast, efficient production of a wide variety of enablement materials, including formal and informal training and performance support.